In 2010, we transformed a vacant, weed-infested lot next to The Environmental Center into an outdoor classroom. 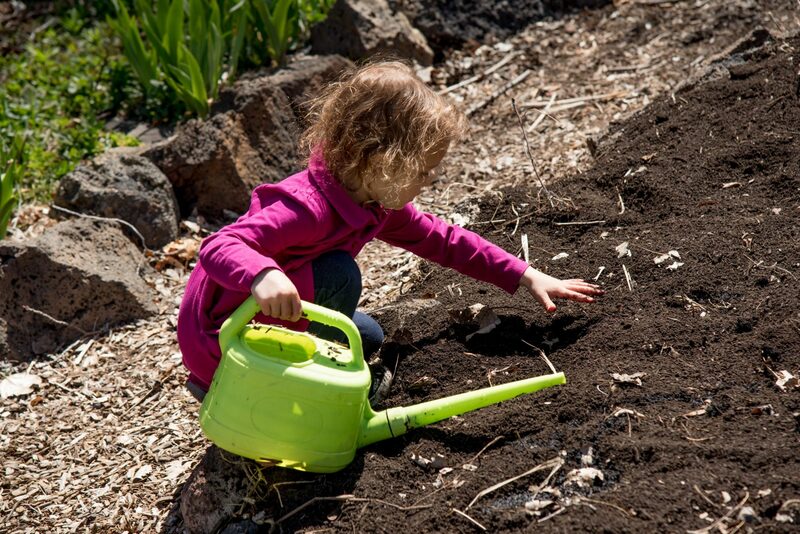 Here, children tend to the seeds they plant, make discoveries through weekly observations and experiments, apply math and science skills, and get their hands dirty. Through partnerships with nearby Amity Elementary School during the school year and our local Boys & Girls Club during the summer, we connect children to the basis of all life—food. Kids witness and experience cycles, growth, hard work, weather and patience. They leave the four walls of their classroom and step into the classroom of life. Contact Denise, Garden Program Manager, if you have any questions about getting involved. Come visit our beautiful Little Free Library in our Learning Garden! Thanks to the Bend DAR Chapter for installing and maintaining this library, and to local artist Monica Helms for the beautiful artwork. The library contains books about our environment, nature, and gardening for both youth and adults. Feel free to come by and take a book or leave a book. We’re taking what we’ve learned here on Kansas Avenue to more local kids and schools. Our vision is a garden for every school in Central Oregon.